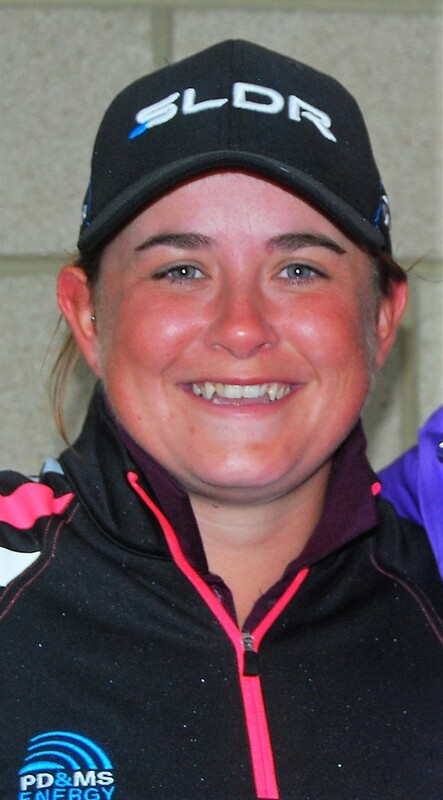 Queanbeyan, NSW, Australia – March 7, 2019: Iceland's Valdis Thora Jonsdottir fired a career-low eight-under 63 in round one of the Women’s New South Wales Open presented by Worrells on Thursday to take a three-stroke lead over Astrid Vayson de Pradenne. Michele Thomson, pictured, is tied for fifth place with a three-under-par 68. Starting from the ninth, the 29-year-old Jonsdottir wasted little time in climbing the leader board at Queanbeyan Golf Club with four birdies in her first five holes. She bogeyed the 18th, but then quickly recorded a pair of birdies followed by an eagle on the third hole, signing off with another birdie on the par-five seventh. Jonsdottir, a gold medal winner in the inaugural European Mixed Team Championships at Gleneagles in August, said that she was playing pain-free, but swinging slowly due to a persistent back problem, which has led to her to withdraw from the Jordan Mixed Open next month. Last week, she was barely able to sit up in bed and she has decided to go home to Akranes next week to see a doctor. She said: “My back has been hurting a lot the last five weeks, so I have decided this week that I’m going to swing it very slowly. I kept the ball in play and hit a lot of good iron shots into the green and made a lot of good putts. Vayson De Pradenne, who was due to share accommodation with Jonsdottir in Jordan, also fired a career-best round, of five-under-par 66. The 2018 Jabra Ladies Open champion, from Chateau-neuf-de-pap in France, was thrilled with her return to form. She said: “My mind was very focused, my iron play was strong and my course management was wise as well, as I took the wind into consideration. We are playing at altitude so there is an effect there and there are some key holes which look wide but actually have very narrow fairways. My putting was also very good and I’m glad because I had an argument about it with my coach last week. “He told me that I was not aiming the putter face where I thought I was aiming, which put a shadow over my putting and it was maybe not the right moment to correct it. I had 28 putts today just thinking about some simple things such as how to read the putts and where to aim. New South Wales’ Rebecca Artis is the best Australian in a tie for third with Spain’s Carmen Alonso on four-under-par. Artis was pleased with her round, saying that her recent form had been below average. Michele Thomson (Meldrum House) is a shot back on three-under in joint fifth alongside Manon Gidali from France. Meanwhile, Whitney Hillier, Felicity Johnson and Munchin Keh, who all played in much colder temperatures in the morning, share seventh with Nina Pegova and Carly Booth on two-under-par. Last year’s champion, Meghan MacLaren, fired a one-under-par 70 to sit in a seven-way tie for 12th place.